Tell an artist how much you value her Creative Work. Send a Custom Greeting of appreciation to a Woman Artist. Pay your fee. Note your receipt number/transaction I.d. number. and email address (if you are requesting a custom e-greeting). International orders will automatically be classified as a request for a Custom E-greeting to be emailed to your Recipient. Please be sure to include her email address with your request. 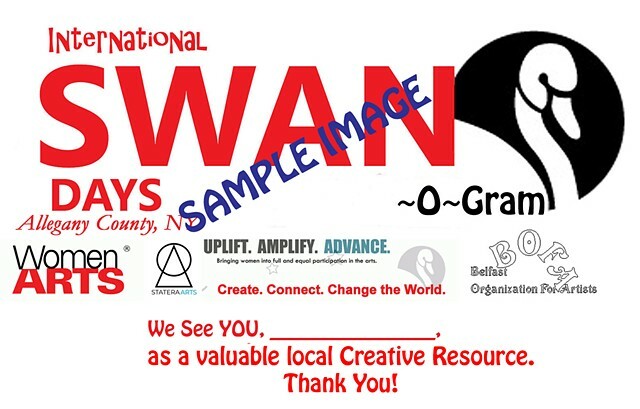 SWAN-o-Gram Custom Greetings are an official Fundraising Project of SWAN Days Allegany County, NY. Your fair market rate SWAN-o-Gram purchases are NOT tax-deductible.